Thought you could only check out at the library? Try checking in. Whether you know it or not, patrons may already be “checking in” at your library! Foursquare, the latest social networking application is slowly catching on around the country and the library is not immune. Most basically, Foursquare, along with other similar applications (loopt.com, gowalla.com,and brightkite.com) gives the user a way to share his or her location with his or her friends on Foursquare as well as Twitter and Facebook if desired. 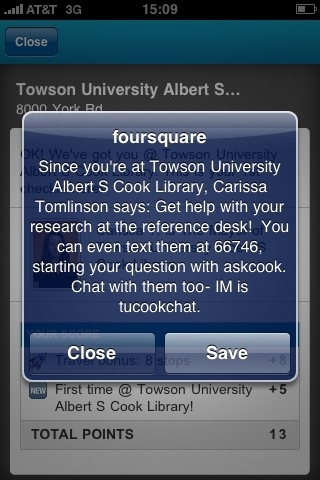 However, a patron advertising use of the library (by checking in) to his or her friends is just one of the many ways that a library can use Foursquare for library marketing and even instruction! One of the major draws of Foursquare for its users is that it has game components. Not only are you letting your friends know where you are, but you are also competing against them for the most places visited. Additionally, Foursquare has integrated a “mayorship” aspect where the person who checks in at a particular location the most becomes mayor. 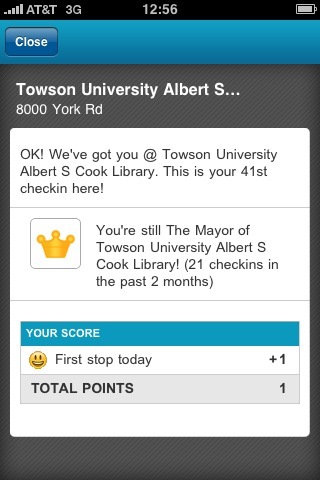 As a Foursquare user myself, I’m surprised as to what lengths I’ll go to just to become mayor of my favorite places. Libraries can further this competition by giving an incentive to patrons who become mayor. Incentives can range from prizes such as library t-shirts or mugs even to library fine reversal! Libraries without money for prizes could give the prize of fame by posting the mayor’s name prominently in the library. Foursquare can even be used as an instructional tool. Tips can be added to locations so that when a person checks in at your library or at an establishment near your library, a tip will pop up on the screen. Multiple tips can be added by you and your patrons, however only one tip per check in will be displayed. As these tips are displayed, they can be saved by the user and checked off as they are accomplished. This system could most certainly be used in a library or university orientation session. 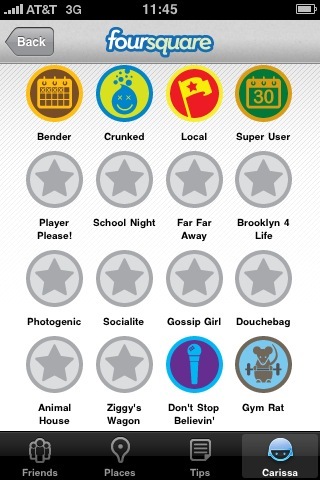 In addition to points, mayorships, and tips, Foursquare also has another gaming component- badges. Badges are available for completing any number of different check-ins. Get the “Gym Rat” badge for checking in at a gym facility ten or more times in a month, or get the “School Night” badge for checking in after 3am on a school night! How could these badges be used at a library or university setting? Companies, organizations, and even universities are working with Foursquare to develop badges related to events or in the case of Harvard University places around campus. Harvard’s badge is used for new student orientation. While getting a badge developed for an individual library maybe a difficult task, working with other libraries or even the university at large may help development. That badge could be used in turn for a variety of marketing, instructional, and even recruitment purposes. What about privacy!?!? While Foursquare does share a person’s location, it does so only when that person chooses to share. A user can even check in without sharing his or her location with anyone, therefore accumulating points, badges, or mayorships without divulging location information. Another thing to keep in mind is that your library location is most likely on Foursquare whether you put it there or not, so why not capitalize on something that your patrons are already using? While I’m not sure I’d recommend that libraries or universities require students to play Foursquare for any assignment, Foursquare is a great way to market services to students already using the social networking tool.